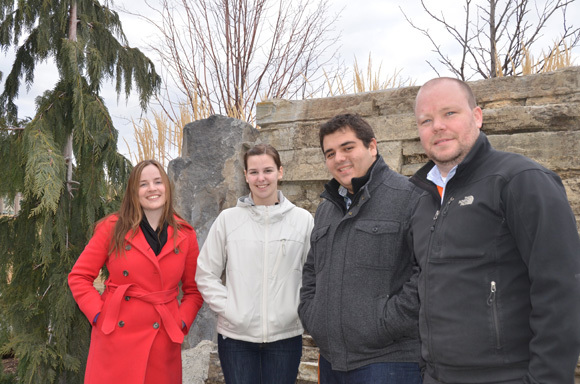 Canadian Conference for Student Leadership organizers (from l-r) Jacqueline Beaulieu, Robyn Giffen, Guillermo Angel , and Greg Mather are looking forward to hosting some 245 students from across Canada this weekend. When you host your peers for the first time, you work hard to impress. That is certainly the case at UBC’s Okanagan campus where students are hosting the Canadian Conference on Student Leadership in Kelowna this week, March 7 to 9. This is the first time the event is being held in BC and the local organizers have packed the agenda with a wide range of activities and all-star keynote speakers. Former Vancouver Canuck captain Trevor Linden is one of four keynote speakers. Linden will be joined by War Child Canada founder Dr. Samantha Nutt, innovative and inspirational speaker Blake Fleischacker, and John Buck, associate dean of students at Webster University, St. Louis. More than 245 students from across Canada are registered for the three-day event which will take place at the Delta Grand Hotel. Beaulieu describes student leadership as an important, but sometimes, forgotten piece of a good education. It gives students the chance to organize events, network with each other, and learn new skills — all essential for a well-rounded education. She uses the example of two doctors — both at the academic top of their class. But it’s the doctor with those soft skills, who can communicate well, show leadership, and deal with tough decisions, that will be more sought after. And soft skills range all over the map — from how you handle a difficult conversation with a colleague, to how you step in to help a friend in need, how you treat your family, to event planning, and volunteerism. Angel, who is co-chair of marketing and communication for the conference, says he has gained valuable knowledge while being involved with the event. It’s the stuff you can’t learn in a classroom. The conference, which is open to undergraduate students, graduate students, university faculty and staff , is comprised of plenary sessions, leadership workshops, roundtables and a leadership café. Delegates arrive Thursday and sessions, which range from communication, prioritization, time management, cross-cultural leadership, how to learn through travel, and volunteer management, run all day Friday and Saturday. Beaulieu notes that many of the sessions have been developed and will be facilitated by students from UBC’s Okanagan campus. Angel agrees and says he expects to get more than just a good experience from the three-day event.